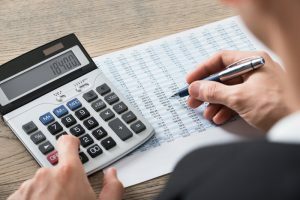 Calculations…not only for professionals in finance, but all of us, in one way or another, are adding prices or subtracting expenses, and so on. And the tool which helps us in this endeavor is the trusty calculator. 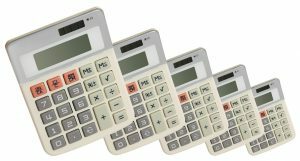 With advances in our smart accessories, we can use our smartphones/watches to compute, but nothing is better than a real calculator when you need to tally your numbers. In this post, we will examine calculators. Most of us think all calculators are the same. But this could be further from the truth. Hopefully, the points we raise, information we share, can assist you in selecting and purchasing the best calculator for you! When calculating numbers, whether it be for household expenses or business proposals, we need accuracy and desire speed. Therefore, the ease in both pushing the keys and viewing the display screen are instrumental. It is said that a calculator, if used properly, can be used for ten years. 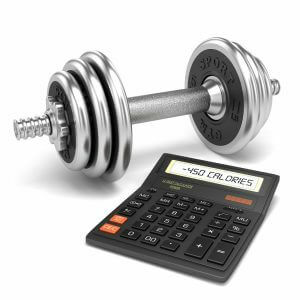 Which is another reason, it is advisable to select the most suitable calculator for you! 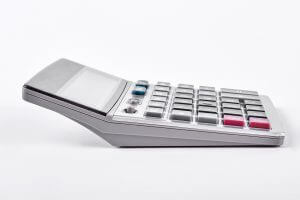 The following are some of the factors you should consider when purchasing a calculator. From calculators fitting in your pocket to those the size of a tablet, there are many sizes to this product. Though a large, tablet-sized calculator will have a display easy to view, the loss of desk space due to size is a point to consider. However, a calculator that is small will have the compact keys gathered without ample space between the keys, making input mistakes easier to occur. Therefore, when considering size, our recommendation is to consider the space between the keys, as accuracy is one of the main reasons we purchase a calculator. And, when in doubt, go with the bigger sized calculator. If the keys of the calculator are small, it is most likely the gap between the keys will be narrow as well. The narrow gap means the chances of pushing two keys at the same time will increase, therefore raising the probability of errors. Who needs the stress of having to recalculate the figures due to an error in inputting the numbers? Therefore, we recommend examining both the size of the calculator and the width between the keys before purchase. As a general rule, we recommend looking at calculators that are at least as large as the palm of your hand. For bookkeeping exams in Japan, some of the questions involve calculation in the 100 million range (100,000,000). Having a small display will slow down the calculations and add unnecessary stress and errors. Again, a general rule, 12-digit displays are the best but at least 10 digits (12345678910) is the minimum. As you become accustomed to your calculator, the speed of input will increase. And you will find that instead of “pushing” the keys, you are beginning to naturally “strike” them. If you have a lightweight calculator, the force of the input may cause the key to misalign, causing errors in the calculator’s interpretation of your input. Therefore, a slightly heavier, sturdy calculator is recommended. We also recommend (if possible) purchasing a calculator with rubber anti-slip pads on the backside. In addition to preventing damages/scratches to your desk, the lack of slide will prevent the calculator from moving around, allowing ease of accurate and speedy calculations. There are many functions within a calculator. But even within all these functions, we have picked up a few functions which we feel are important deciding factors. Key rollover allows the “o” to be inputted while the “d” is still being pushed. And like the keyboard, the key rollover function is the same. Therefore, users are not penalized for having speedy fingers. However, do note that if the key “1” and “2” are pressed at the exact same time, “12” will not appear. The key “1” must be pushed before “2” for “12” to appear. The calculator scans the numbers based on the input order. Based on the calculator, users have the option to choose 2-key rollover or 3-key rollover. For purchasing, a 3-key rollover is a good choice. Imagine having to tally the results from multiple calculation problems. You input the figures from problem 1, write down the answer. You input the figures from problem 2, write down the answer. In the end, you have to input the answers from problem 1, 2, and so on to get the grand total. Isn’t this tiresome? If your calculators had the GT or Grand Total function, this tedious writing down and inputting would vanish! While calculating problem 1 and 2, the calculator will only display that problem’s digits, but the GT function allows the results of these two calculations to be stored in the internal memory. If the GT key is pressed at the end, the sum of the two calculation results, 1700 (1500+200) will be displayed. This function is useful in both bookkeeping examinations as well as for calculations in everyday life. Therefore, we recommend seeking a calculator with this function. Like the GT function, the “M” memory function is another must-have function. 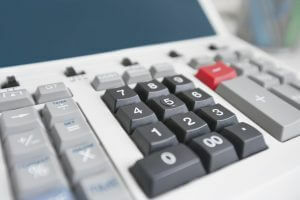 The memory function allows special numbers or calculation results to be temporarily stored in the calculator’s memory. 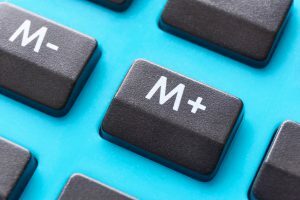 Both of these functions are so crucial in the bookkeeping world that is often remarked: “those who master the grand total and memory functions are the masters of the calculator!” Therefore, we strongly recommend utilizing (and mastering) these functions. A calculator is often kept on the desk. Therefore, the light from a window or the room’s lighting (bulb, etc.) can cause a glare, affecting how the numbers can be seen. Having a tilt display allows the user to adjust the display screen to the best position according to the lighting situation. However, many calculators which do not have this function have a sloped display. Therefore, the tilt display function does offer convenience but isn’t a very necessary function. 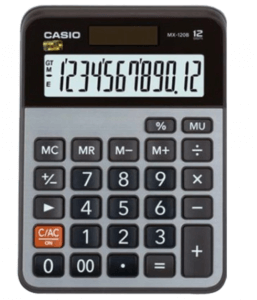 The three major calculator manufacturers are Casio, Sharp, and Canon. The major difference between the three manufacturers is the placement of the keys. 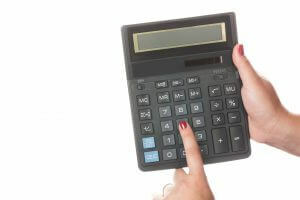 Where the keys are located affects the ease of use, this is a major consideration when choosing the calculator. 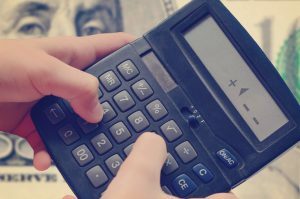 After discussing the factors to consider before purchasing a calculator, let’s examine the actual calculators available online! Using the factors listed above, our ranking of the Top 10 Best Calculators to Buy Online in the Philippines are as follows! With a 12-digit large display, this is a simple calculator to fulfill many needs. The dimensions are 10.3 cm x 2.5 cm x 14.5 cm with a large display, making it easy for the user to write down the results of the calculations. Though the GT function is not present, memory function and a 2-key rollover are present for those with speedy fingers. 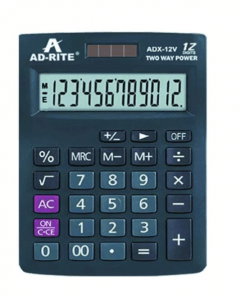 Therefore, the AD-Rite ADX-12V is recommended for people who need to input a large number of figures quickly. Priced reasonably, this calculator is powered by both batteries and with solar energy. This calculator contains large keys which allow users to be certain which key they are inputting in the calculation. The 12-digit large display is sloped, allowing ease in seeing both what is inputted as well as the results. The dimensions are 14 cm x 19 cm. The calculator contains memory and GT function. 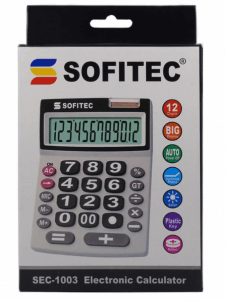 The large display and large keys for the figures may be suitable for users who are hesitant in their calculations. Priced nicely, this is a good product for beginners or those who want to relax their eyes during calculations. This rather cute calculator may be a good option for those who are tired of the standard black, gray calculators. The 12-digit slope-type display is clear and reduces vision fatigue. 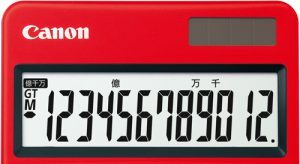 The dimensions of the overall calculator are 11.9 cm x 14.8cm x 3.6cm. Though the product is cute and colorful, it is a calculator. Both the GT functions and memory functions are included in this device. And there are anti-slip pads to secure the calculator in a stable position. At a good overall price, this calculator may be perfect for those who want to calculate with a little more fun. Very reasonably priced, this 12-digit calculator has an extra-large display as well as input keys. The sloped display is welcomed by the eyes and the anti-slip measures on the backside of the calculator is favored by those with power. The dimensions are 12.8 cm x 12.9 cm. As with the Osalo OS-837 ranked in 6th place, the color orange of the CITLLZEN product adds a fun a factor to the device. However, it is a calculator with memory and GT functions present. The large delete button, as well as the low price, make this an item to watch! This 12-digit calculator is known for its durability with its tough case to battle damages that may be received during the purchaser’s commute. The dimensions are 14.7 cm x 10.65 cm x 2.9 cm. Though the calculator has the memory functions, the GT function is missing. However, the key rollover function is present, allowing speedy users to input without loss. As part of the “Value Series,” the price is reasonable as well with a large display for ease in reading the figures. 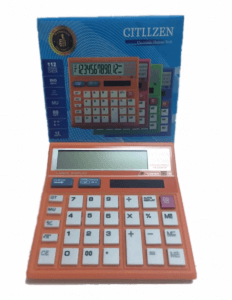 Similar to the Osalo OS-777VC ranked in 4th place, this calculator is recommended for businessmen who work in multiple locations. The durable case can withstand travel and the key rollover function allows speedy inputs at customer sites. 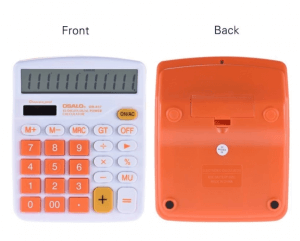 This 12-digit display calculator is one of the most must-have home office equipment. With a dimension of 9.65 cm x 15.5 cm x 2.45 cm, the calculator does not take up a lot of desk space, yet the keys are large with ample space between each other to discourage mistakes in an input. And with this size, there is little fear of the calculator moving around the desk during rapid inputs. This calculator received the number one ranking for its functions. In today’s list of reasonably priced calculators, it is the only one with all three of the calculation consideration factors listed above. This device has GT and memory functions as well as 2-key rollover giving it high marks. 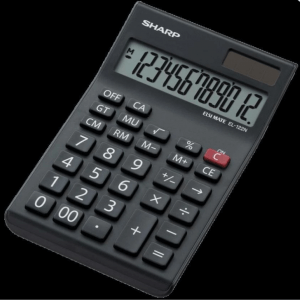 Considering the life of a calculator to be ten years, the Sharp EL122N has the functions, is sized well, and the keys are easy to use. Adding in the dual power source and the reasonable price, we rank this number one in our best calculators to buy online! Calculators are not very glamorous office tools but the differences in the products can make them useful personal accessories. From fun to multiple functions, products considering your vision and “striking” power, hopefully, this guide was able to help you realize your preferences and purpose of purchase. The factors presented are suggestions but hopefully, they can guide you making an educated, positive purchase. Good luck!